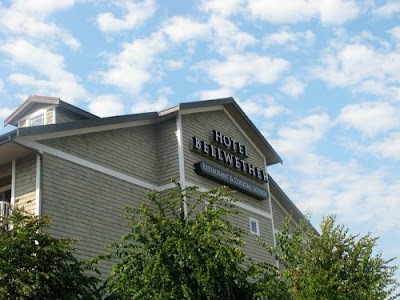 If you're a BC resident and have a hankerin' to head south of the border, Bellingham's Hotel Bellwether is offering a No Sales Tax promotion to residents of British Columbia. Simply put, you'll save 8.5% off the total cost of your room. As an added bonus, Washington state recently announced a sales tax exemption for non-residents, although it does not apply to lodging. So that means you can shop at nearby Bellis Fair and Trader Joe's, sans sales tax, and then head to your room with a view at Hotel Bellwether, featuring fireplaces and jetted soaking tubs. Since I'm not much of a mall person, another fun shopping option is Bellingham's Fairhaven District for shopping, cuisine and history. The Bellwether has two dining options on site: Harbourside Restaurant and Lounge, featuring west coast cuisine, and the Sunset Lounge for sunset for lighter fare, cocktails and sunsets over Bellingham Bay. Weather permitting, of course. The No Sales Tax promotion is valid July through September, 2010.